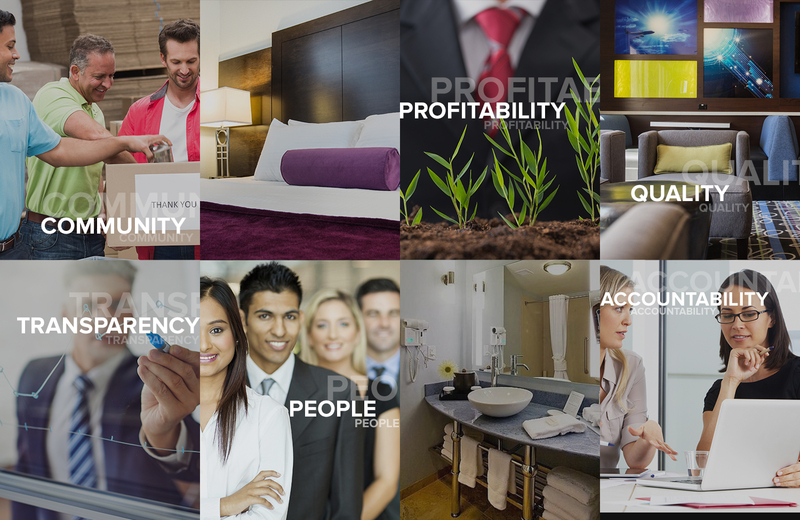 At Zenique Hotels, our passion for the hospitality industry is highlighted by our dedication to six core values. To fulfill our commitment to success, we take pride in people, accountability, transparency, quality, profitability, and community. These values are the foundation upon which we have built our company and our reputation. With this common goal in mind, our team continually strives to achieve the highest quality possible. Whether you are working with Zenique as a guest, employee, or investor, we are sure that you will enjoy your experience. Our commitment to being an industry leader has set us apart from our competition. We ensure that every detail meets the high standards that Zenique has set for itself. With these values and principles, we are sure to live up to our mission of creating a rewarding experience for our guests, our associates, and our investors through developing, repositioning, and operating exceptional hotels nationwide. To guarantee high quality services, we start by ensuring satisfaction of all associates working for Zenique Hotels. By focusing on our employees’ fulfillment, we can secure quality services for our guests as well as high returns for our investors. To verify satisfaction, we conduct Associate Satisfaction Surveys to uncover areas in need of change or development. Through this feedback, we are able to not only improve our supervisors, managers, and executives, but also our company as a whole. At Zenique, we inspire and motivate our associates by celebrating success and recognizing outstanding employees. By utilizing awards such as employee of the month, and conducting friendly competitions, we hope to encourage employees to live up to their true working potential. Furthermore, we provide continual training and coaching to show employees the path to success. We are committed to giving our employees the chance to shine, in all positions. Associates, supervisors, and managers alike are all provided with opportunities to achieve performance based bonuses. We strive to incentivize employee performance improvement by granting awards to deserving workers. And as usual, we are always open to associates’ comments, questions, and suggestions. Satisfied employees become committed employees. With committed employees, Zenique is able to provide the most outstanding services and ensure that guests and investors are also satisfied and committed. At Zenqiue Hotels, we strive to create a positive and memorable experience for all. From our guests, to our team members, to our investors, people make us successful! We are devoted to always acting in their best interests. Frequent, open, and direct communication is Zenique’s fundamental belief. Our people have the right and duty to be included and involved. Our People are expected to take responsibility and are required to be accountable for their actions. We believe that team members will motivate, lead, and hold each other accountable. We are committed to quality in our hotel design and service with an unrelenting commitment to professionalism. We are dedicated to provide our investors with the highest returns possible. We appreciate their belief in us and recognize we cannot grow without them. We support good citizenship. We are committed to giving back to our host communities and recognize our team members belong to them.